This page mainly describes the latest version of the EasyDriver board. Bruce Shapiro got me to design and build the UBW (USB Bit Whacker) project to solve his problem of disappearing parallel ports on computers. The UBW design has exceeded all of my expectations. As well as meeting the original design objectives, it has proven itself a great platform for many forms of firmware. But there was still a problem! Bruce traditionally used the UCN5804B stepper motor driver chip for his EggBot classes because it is easily breadboardable and very simple to use. Unfortunately, they are now $17 each and very difficult to find. Bruce wondered if I could design and build a replacement driver that would still be mountable on a breadboard, would still just need two input lines (step and direction) and would drive bi-polar stepper motors. And so now we have the EasyDriver design. There is now an official EggBot that you can purchase! It uses an EiBotBoard, which I designed and consists of a UBW + 2 BigEasyDrivers. The EiBotBoard is now available for purchase at SparkFun and Evil Mad Scientists. Over the years, the Easy Driver has become popular enough that lots of people have copied it and are making and selling it. I am flattered, truly I am. And this is open source hardware after all. However, any other manufacturer of Easy Drivers besides SparkFun and SeeedStudio are doing so without supporting me in any way, which means I then have fewer resources to design new OSHW. The license that the EasyDriver is released under requires at least some attribution. These knock-off manufacturers will normally strip off the "SchmalzHaus.com" silk screen before they build 'their' boards, see for example Electronics DIY. It appears that Electronics DIY has decided to build Easy Drivers, taking off the "Schmalz Haus" part of the silk screen, and not mentioning anywhere on their page where the design came from (i.e. no 'attribution'). This is in violation of the license. There are lots of others too - all of the very inexpensive EasyDrivers that are now on EBay, Amazon, and Aliexpress are knock-offs. None of them support me in any way, but I end up fielding tech support for their boards because people write to me with questions. So please help support OSHW and buy from SparkFun or SeeedStudio. They are fantastic and not only believe in the value of OSHW but actively support designers like me. Each EasyDriver can drive up to about 750mA per phase of a bi-polar stepper motor. It defaults to 8 step microstepping mode. (So if your motor is 200 full steps per revolution, you would get 1600 steps/rev using EasyDriver.) This setting can be easily overridden by tying the MS1 and/or MS2 pin to ground to set the driver to use 1/8, 1/4 or 1/2 microstep mode (See the datasheet for the table of values). It is a chopper microstepping driver based on the Allegro A3967 driver chip. For the complete specs of the design, read the A3967 datasheet. It has a variable max current from about 150mA/phase to 750mA/phase. It can take a maximum motor drive voltage of around 30V, and includes on-board 5V regulation, so only one supply is necessary. The best part - low cost. The parts cost is easily less than $10, even less if you make the board yourself. GND : There are three GND (Ground) pins on the Easy Driver. They are all connected together inside the board. Connect the negative side of your power supply, as well as from any other boards you are using to drive the Easy Driver to one or more of the GND pins. A and B : (four pins) These are the motor connections. See below diagrams for how to hook these up. A and B are the two coils of the motor, and can swap the two wires for a given coil (it will just reverse the direction of the motor). Make CERTAIN that this connection to the motor is solid, and NOT through a connector that has any chance of intermittent contact (which will fry the motor driver chip). STEP : This needs to be a 0V to 5V (or 0V to 3.3V if you've set your Easy Driver that way) digital signal. Each rising edge of this signal will cause one step (or microstep) to be taken. DIR (Direction) : This needs to be a 0V to 5V (or 0V to 3.3V if you've set your Easy Driver up that way) digital signal. The level if this signal (high/low) is sampled on each rising edge of STEP to determine which direction to take the step (or microstep). That's it - those are the only signals that you absolutely need to connect to anything. All the rest below are optional - in other words, the Easy Driver sets them to reasonable default values. MS1/MS2 : These digital inputs control the microstepping mode. Possible settings are (MS1/MS2) : full step (0,0), half step (1,0), 1/4 step (0,1), and 1/8 step (1,1 : default). RST (reset) : This normally high input signal will reset the internal translator and disable all output drivers when pulled low. SLP (sleep) : This normally high input signal will minimize power consumption by disabling internal circuitry and the output drivers when pulled low. ENABLE : This normally low input signal will disable all outputs when pulled high. 5V : This is an OUTPUT pin that will provide either 5V (default) or 3.3V from the voltage regulator, at a small amount of current (say 50mA - depends on input voltage) to power a circuit that you may need powered. If you cut jumper APWR (SJ1) then you can use the 5V pin as a VCC input to the Easy Driver, powering it with your own VCC supply. Oh, so awesome: where can I buy one! I do not sell EasyDriver boards. This design is open source hardware released under a creative commons license. It was developed in conjunction with SparkFun, and they manufacture and sell it. I'm providing Eagle schematic and board layouts as well as a Bill Of Materials and instructions on how to build and use the design if you want to take the design and modify it for your own use. If you do decide to manufacture the EasyDriver for yourself or for sale, please remember that royalties are the only way that I can continue to provide support to Easy Driver users, so contact me. SparkFun DOES sell EasyDriver boards and they're only $15 each! Also, please note that a Bigger, Badder, and all around Better version of the Easy Driver has been designed. It's called the Big Easy Driver (BED). You can read all about it at the Schmalz Haus Big Easy Driver page. (11/16/2012) I did some measurements of temperature and current draw with a SparkFun stepper motor and an EasyDriver. See the results lower down this page, under Question 14. (10/13/2012) Xavier wrote a great tutorial on using Easy Drivers with Arduino. (07/20/2012) MyDIYCNC is now using Easy Drivers in some of their products, and is even selling the driver boards in their store. Check out their cool CNC machines. 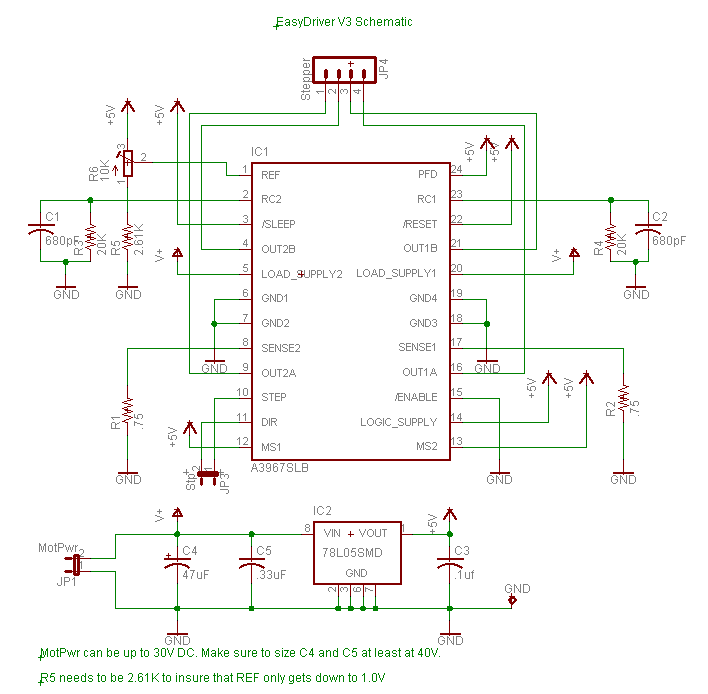 (02/11/12) New Easy Driver and Big Easy Driver Examples page - with Arduino code, diagrams, etc. (02/11/12) On a whim, I tested to see what the lowest voltage is that the Easy Driver could run on. It had no problem running down to about 4V (this is with a factory fresh Easy Driver 4.4). And, it ran really cool. Note that you'll need a very low coil resistance motor to make this work very well unless you are using full or half steps. (08/19/11) We now have an Eagle part library with the EasyDriver v4.4 in it for anyone who wants to plunk down EasyDrivers on their board. (08/03/11) It appears that there are two different types of current adjustment pots being used for EasyDriver v4.4 production. If you have one with the squarish white box of a pot (as per the v4.4 picture on the top of this page) then your MIN and MAX silkscreen will be backwards. The previous version of the pot (see v4.3 pic) has its pins in the right place, so that the MIN and MAX silk screen labels are in the proper place. I don't know why the pot vendors would choose to make their parts backwards, but that's how it goes. Anyway, be careful. Note, the board is identical, it's only that one pot is designed backwards from the other. (10/21/09) Note that v4.3 and v4.2 (and possibly others) have the MIN and MAX words backwards on the board. So if you have a small motor, be CAREFUL! The likely result is that you will set it to MIN, but a full 750mA will go through your motor, and it will get quite hot. There will be a new v4.4 soon which will fix this problem. (12/02/09) Version 4.3 has now been released to SparkFun - only difference being two mounting holes. (09/17/08)Daniel Thompson has created an awesome tutorial (with movie) on using the EasyDriver with an Arduino to run stepper motors! Thanks Daniel! NOTE: Many people attempt this setup without connecting the grounds of the power supply, EasyDriver and Arduino (or other pulse source) together. It tends to not work that way! So make sure you always connect the grounds, and you'll have much better luck. (5/23/07) Added project files for V3 design. (4/6/07) Initial webpage created. 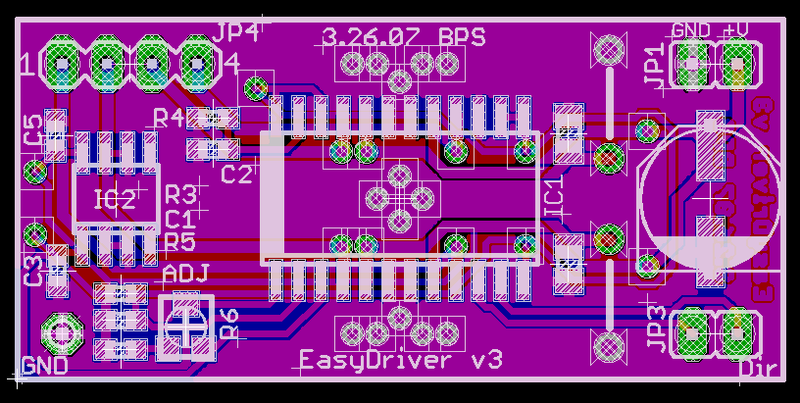 Documents V1, V2, and V3 design revisions of EasyDriver board. EasyDriver V1 - This was the first attempt. I had two boards fabbed at BatchPCB (Very highly recommended). The design worked fine but because the board was so small it got _way_ too hot. Also did not have variable current limit or 5V regulator. EasyDriver V2 - This was the second attempt. I had some boards fabbed at Futurlec without solder mask or silkscreen. The board was twice the size of V1, and routed to dissipate heat much better. The 5V regulator was added. I have since modded the completed boards to add the variable current limit. EasyDriver V3 - A refined version of V2, with the variable current limit on the board, and switched to 0603 components. I have not had any of these boards fabbed yet, as I'm confident in the design from the V2 boards. - Update: SparkFun is now selling these, and they work fine. Every I/O pin on the driver chip now comes out to headers, and is pulled up (or pulled down) with 10K resistors. This means you can now control every aspect of the driver chip yourself. You can change MS1 and MS2 to do full step, half step, quarter step or 1/8th step. You can put the chip to sleep or in reset (drastically reducing power consumption). Also, you get to play with PFD signal. That horrible tiny pot from V3 is now a somewhat larger pot. :-) The really nice thing is that it doesn't have continuous rotation, so you know where MIN and MAX current are (finally!). A power-good LED has been added so you know when the EasyDriver has 5V from the on-board regulator. A ground pin has been added next to the STEP and DIR pins. This allows for a 3-pin cable to your Arduino or whatever you use to drive the EasyDriver. By soldering SJ2 closed, you can switch the logic supply voltage for the EasyDriver from 5V to 3.3V. This allows interfacing with things like 3.3V Arduinos or other processors that only output 3.3V. If you want to supply your own logic power to the EasyDriver, cut jumper SJ1, and supply 3.3V or 5V into pin 1 of JP4. 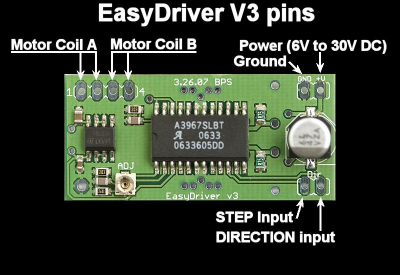 If you want the EasyDriver to power some small circuit, you can use the 5V (or 3.3V) coming from pin 1 of JP4. How much current can you pull from here? Well, feel the regulator. If it is uncomfortably hot, then you're using too much. How hot it gets depends upon what voltage you supply to the EasyDriver. TP1 allows you to put a meter on the VREF signal as you turn the current adjust pot. Measuring this voltage allows you to calculate the actual max current being supplied to the motor. See the schematic for information on how to do this math. I never do this myself - I adjust the pot until things 'feel' right on my motors since every situation is different. The value of the bulk cap is listed at 100uF on the datasheet, but 47uF is all that is really necessary. The bigger the better - but the Allegro datasheet says 47uF is fine. SparkFun may use 47uF caps on their boards and that's OK.
EasyDriver V4.3 - Exactly the same as V4.2 except two mounting holes have been added based on user requests. EasyDriver V4.4 - Exactly the same as V4.3 except the MIN/MAX silk screen error has been fixed (well, not really, since the current adjustment pot got changed) See note Q9 below. 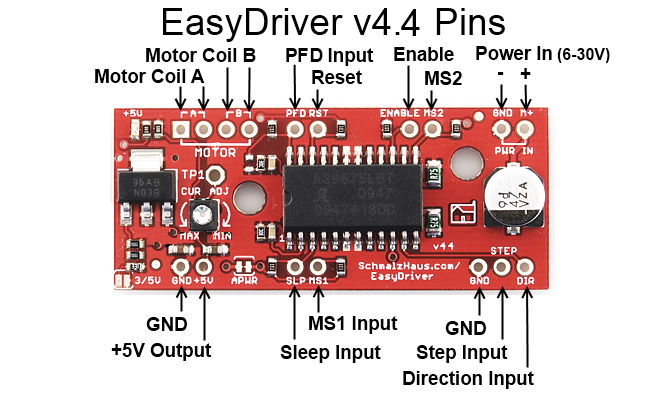 EasyDriver v4.5 - Major change from v4.4 was the addition of series current limiting resistors on STEP and DIR as well as pull downs on STEP and DIR. This helps prevent damage during over voltage events. Q1) My motor says it can only take 2.1V at 2A. Will the EasyDriver (running from up to 30V) blow up my motor or damage it in any way? A1) Nope. You're safe. Motors are specified with DC flowing through their coils. But what we are concerned with is maximum current. The voltage spec of the motor doesn't really matter, using the EasyDriver. (Or any chopper driver, for that matter.) The EasyDriver will ramp up the voltage to the coil until the _current_ reaches the maximum set with the pot (max of 750mA). Then it will cut the power to the coil until the current dips down again, then re-apply power, over and over again, about 20,000 times per second. Any motor that's rated for 150mA/coil (or more) will work with the Easy Driver just fine, no matter what it's voltage rating. Note that if your motor is rated for less than 750mA/phase, you should adjust the current set pot on the EasyDriver to dial down the maximum coil current to match your motor. A2) No. The voltage rating of the motor DOES NOT MATTER. Really. Trust me on this. At least to a point. You want to run the EasyDriver with as high a voltage as needed for your application. Lower voltages produce a lot less heat (on the ED and the motor) but produce lower maximum speed and torque. Higher voltages (up to 30V) get you more torque at higher speeds, but your ED will get much hotter. You make the decision. Also, the higher the input voltage, the greater chance of frying your ED if your motor wires come undone for some reason. Most people are perfectly happy running their ED at 12V, and there are tons of power supplies that work great at 12V and are cheap. The technical reason for this is that the Easy Driver is acting like a switching power supply. It is stepping down the voltage and stepping up the current. The coil of the motor is basically like the inductor in a buck converter. The chopper circuit switches the coil voltage on and off to maintain a constant current through the coil. Note that you can run the EasyDriver with a supply voltage of as low as about 3V. This does NOT mean that you will get good stepper motor performance at that voltage (actually, I can almost guarantee you will not). However, even at 7V or 9V, the torque on most stepper motors is near their max, at lower speed. Where you really need the higher input voltage is at higher step speeds. Another important point that a lot of people don't realize is that many times, you don't really need the full, rated torque of the motor for your application. For example, the small stepper motor from SparkFun (https://www.sparkfun.com/products/9238), develops a very large percentage of its fully rated torque even with 9V of input to the Easy Driver and the current adjustment turned all the way down to 150mA/coil. In other words, you probably don't have to break you back trying to make out the motor's rated current, and thus rated torque. Try it in your system first - you may be surprised with how much torque can be generated with a smaller current and voltage. Q3) How much current does my power supply need to produce? A3) The max that the EasyDriver can shove into the motor is 750mA/coil. With 2 coils per motor, that's 1.5A. So your power supply needs at least 1.5A to be completely safe. However, you can normally get away with less than that and still be just fine. Because of the way a chopper driver works, the driver and motor actually form a sort of switching power supply. Let's say that in order to reach 750mA/coil, the ED needs to only ramp up the voltage to the coil to 6V. So if you're supplying the ED with 12V, then the driver is working like a step down power supply from 12V to 6V (we're sweeping a lot of things under the rug here, but stick with me) so we only need to supply it with half of the current it's sending to the motor (because the voltage is cut in half, we only need to supply half the current going into the motor). So in this case, you'd only need a power supply of 750mA. The best advice here is to experiment. If your power supply is not 'strong' enough, the voltage will dip and you will drop steps. (i.e. not enough torque to keep the motor in the commanded position). See the table under question 14 below for some experimental data I took. Q4) So why does my bench power supply show 12V at 400mA when I know my motor should be drawing 750mA/phase (1.5A total)? Huh smarty pants? A4) See above answer. Because of the way a chopper drive works is the real answer. You can NOT trust any sort of power supply current measurement in order to measure the actual coil current at any point in time. In actuality, it is really hard to measure the actual current being delivered to the coil, even if the motor is not moving. You need a special amp meter attachment for a scope. The ones I've used at work are about $5K each. (just for the stinkin' probe) So we just rent them when we need them. Q5) How do I adjust the current limit? A5) Just turn R16 - the 10K current limit pot. At one limit, it will tell the driver chip to supply up to 750mA (limited by coil resistance and input voltage) per coil. At the other limit, it is 150mA/coil. More recent EasyDriver boards have silk screen words MIN and MAX, but you can not trust them. This is because we can never be sure what pot SparkFun uses to build the boards, and some pots are backwards from the others. So always measure the voltage at TP1 and use that as your guide for knowing which way is MAX (maximum TP1 voltage) and MIN (minimum TP1 voltage). 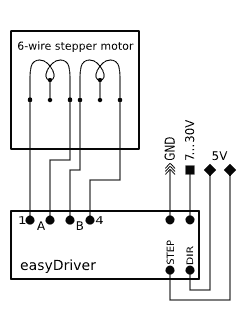 Q5.1) What kind of stepper motors can I use EasyDriver with? Here's a little drawing on one way to hook up a six wire stepper motor to the EasyDriver. Q6) Why does EasyDriver get so hot? A6) PWM current limiting drivers (so-called 'chopper' drivers) are turning the coil currents on and off very rapidly. This makes sure that the maximum amount of current (as set by R16, the current set pot) is _always_ flowing through the coils of the stepper motor, even if it is not moving at all. That's just how these things work. It means that the driver is constantly passing that much current through, and because its internal resistance is not zero, it dissipates some heat. If you turn R16 all the way up so that 750mA flows through each coil, the entire EasyDriver board will get hot to the touch. I've never burned my finger on it, but it certainly gets hot. (At the minimum - about 150mA/coil - it only gets barely warm.) You can put a small fan blowing across the board if you want to. But fear not, the driver chip has a thermal cut out at 165 degrees C, so it will protect itself. The boards have quite a bit of copper pour on them, to maximize heat dissipation, which helps a lot. Also the voltage regulator gets quite hot - this is because the driver chip needs 70mA at 5V for its logic supply. Depending upon what voltage you use into the M+ pin, the voltage regulator needs to drop that down to 5V (and throw the rest away as heat). So the higher the M+ voltage, the hotter that regulator will get. For actual quantitative data, see question 14 below. Q7) What hardware/software can I use to test my EasyDriver? A7) Here's what I do. I solder headers in the pins of the EasyDriver and put it into a breadboard. I solder the wires on my stepper motor to a 4-pin .100" male header, and plug that into the breadboard so it connects properly to the EasyDriver. Then I take a PC power supply, and use the 12V from that into the GND and M+ pins on the EasyDriver. Then I tie the DIR pin to Ground with a wire. Then I take a square wave with a frequency of about 500Hz and put it into the STEP pin. This I generate with a signal generator or an Arduino or UBW. The motor should be spinning at this point. You can then take the DIR pin and connect it to +5V to see the motor go in the other direction. As the motor is running, you can slowly adjust the current adjust pot to see the effect that it has on the smoothness of the motor's motion. Q8) How do I connect my EasyDriver up? A8) (For Version 4.2 and above) All of the pins on the EasyDriver are on a .100" grid. If you solder .100 headers into the pins you want to use, it plugs into a standard breadboard. Once you plug it into a breadboard, you can then plug in your stepper motor to the four motor pins (JP3), your 8V to 30V motor power to the GND and M+ PWR IN pins (JP1), and your Step and Direction signals to the STEP, DIR and GND pins (JP2). The GND pin in the lower left corner of the board is really only there for mechanical support, but it is tied to ground and you can use it as such if you want. You could also construct a simple 'carrier' board (on a proto board or some such) with female .100" headers for all for the EasyDriver pins. Then it would be easy to wire up as many EasyDrivers as you wanted to drive lots of stepper motors. A8) (For Version 3) All nine of the pins on the EasyDriver are on a .100" grid. This means it plugs into a standard breadboard. Once you plug it into a breadboard, you can then plug in your stepper motor to the four motor pins (JP4), your 5V to 30V motor power to the GND and V+ pins (JP1), and your Step and Direction signals to the STP and DIR pins (J3). The GND pin in the lower left corner of the board is really only there for mechanical support, but it is tied to ground and you can use it as such.You could also construct a simple 'carrier' board (on a proto board or some such) with female .100" headers for all for the EasyDriver pins. Then it would be easy to wire up as many EasyDrivers as you wanted to drive lots of stepper motors. Q9) My Easy Driver's labels don't match what I see in the picture. Why not? And how do I know which way to turn the current adjustment pot? One important thing to note is that, on various versions, I've gotten the silk screen for the MIN/MAX of the current adjustment pot backwards and SparkFun has used various potentiometers that have reversed directions (thus making the 'correct' silk screen backwards again). SO! You never really can trust the silk screen on the Easy Driver. Instead, what you need to do is put a volt meter on the TP1 test point (which is connected to the VRef pin on the driver chip) and measure its voltage with respect to ground. The largest voltage on that test point (normally 5V) will result in the largest current through the motor coils (750mA), and the smallest voltage on TP1 (1V) corresponds to the least current through the motor coils (150mA). Q10) Man, this is a lot of work to just use the A3967 chip. Can't I just solder down a bunch of A3967s on my own board design and save a ton of money? A10) Sure. <grin> The EasyDriver board is for people who want to spend a little bit of money and not have to worry about making their own board to hold the driver chip. It is for people who want a design that will 'just work' instead of having to try stuff out for themselves. It is for 'software folk' (like myself) who want to spend time writing code, not debugging hardware. It is for people who want to build an EggBot but can't get the 5804B chips. If you're designing your own board, then don't use an EasyDriver! Just put the chip down on your own board yourself. Q11) The datasheet for the driver chip shows that the motor connects to pins OUT1A, OUT1B, OUT2A and OUT2B, and the diagram in the datasheet has one coil connected across OUT1A and OUT1B, and the other across OUT2A and OUT2B. But the Easy Driver only has A, A, B, B for motor connections, and it looks like one coil should be connected across the two A pins and the other across the two B pins. What's up with that? A11) Yeah. Ooops. Clearly that was a pretty bad choice for the Easy Driver labels. On a bi-polar stepper motor, there are four wires that connect to two coils. Each coils has two wires. The Easy Driver calls those two coils A and B. So one coils' wires are to be connected across the two A pins, and the other coils' wires are to be connected across the B pins. The driver chip datasheet refers to these two coils as coil 1 and coil 2. Sorry for the confusion. See the diagram above for the accurate connection diagram for the Easy Driver. Q12) So what's the deal with microsteps? How do I set what number of microsteps are used? A12) Microsteps are a way to take a single, full step, and break it down into smaller steps. The A3967 driver chip carefully controls the current to each coil to cause the rotate to move to positions in between the normal full step positions. This allows for smoother motion, reduced mid-band resonance, and higher positional accuracy and resolution at the expense of a more complicated driver and somewhat reduced torque. Q13) Help! I think my Easy Driver is not working like it should. How can I know if it's become damaged? A13) One thing you can do is to measure some of the resistances and voltages on the board to see if it has become damaged. With everything disconnected from the ED, measure the resistance from each of the four motor output pins to GND and M+. All 8 of these measurements should be over 1MOhm. Again with everything disconnected, measure the resistance between the four motor output pins themselves. And again, all measurements should be over 1MOhm. Again with everything disconnected, measure the resistance from STEP and DIR to GND and +5V pins. Again, all of these should read greater than 1MOhm. Now connect just GND and M+. Do not connect anything else to the ED. The LED should come on and stay on. Measure the voltage at +5V to GND. It should be right around 5V. Now measure the voltage at each of the four motor output pins to GND. Two of them should read at about the same voltage that is at M+ (your power supply voltage - mine is 12V), and the other two should be almost zero - I measure 0.018V. Also check for any missing components. SparkFun has been known to ship boards with resistors or capacitors missing. See the picture above - there is _supposed_ to be one part missing, but only one. (It's the resistor to the right of the word MOTOR.) If your board has any missing parts, it might not work well. If all of those measurements pass, it doesn't mean you ED is not smoked, but it does rule out internal shorts, which is the most common failure mode for these driver chips. Q14) But Brian, can't you give us some real world numbers for power consumption and heat and stuff like that? A14) Sure! Here you go. Here are some temperatures I measured. Lab grade power supply powering a v4.4 Easy Driver. Current limit pot set to maximum current (750mA/coil) which was called MIN on silk screen. Digilent chipKIT uC32 board running simple AccelStepper sample program which ramped speed from 0 steps/second (for 2 seconds) to 2500 steps/second (for 8 seconds) repeating. Ambient temp in my lab was 70F (21C). For each test I let the system run for about 30 minutes at each input voltage to stabilize the temps. EasyDriver was mounted on a breadboard, and no cooling was used. Temperatures were taken using a calibrated IR thermometer. The coil current was measured with a IProber 520 current probe connected to a Rigol DS11102D scope. Notes on testing: The coil current is not 750mA for some motors and input voltages because the coil resistance limits the current, not the chopping of the driver chip. With the ROB-09238 motor, you can never reach full current because of the coil resistance. The driver chip's internal thermal shutdown temp is 329F (165C). With some combinations of motor and input voltage, the driver chip will go into thermal cutoff because this internal temperature is achieved inside the driver chip. I have marked these in the table with red cell color. When the chip does this, it will cycle the output drivers to the motor on and off (about 1 second on, 1 second off). And yes, I exceeded the rated current for ROB-09238 (330mA) and ROB-10551 (400mA). Normally, you would set the current adjustment pot so that the EasyDriver delivers the max current that your particular motor is rated for. But I wanted to show maximum currents and heating with this table. 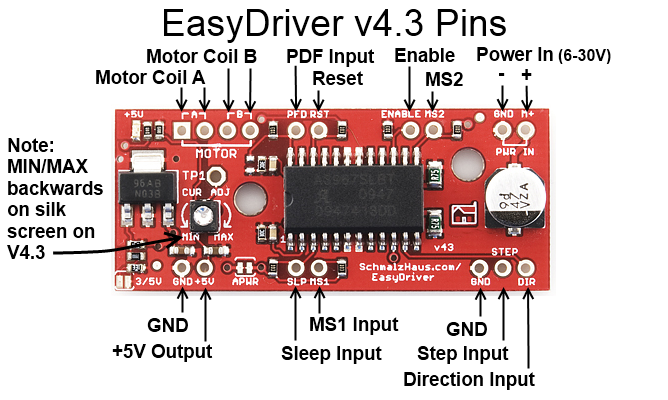 Q15) So I see that the EasyDriver has a pin labeled 5V. What is it for? A15) Well, based on user's e-mails to me, there is a lot of confusion about this pin. It is NOT for powering the Easy Driver at 5V. In other words, it is NOT a power input, or input of any kind. In fact, it's an output pin! Yup, the EasyDriver's 5V regulator has some extra juice, and so we brought out the 5V output of the regulator for you to use if you want. This means that you can connect other things to this pin that need 5V to operate, and the EasyDriver will power them. To a limit, of course. Q16) What do the two jumpers do on the board? A16) The way I designed the EasyDriver is with a power supply that can supply either 3.3V or 5V to the EasyDriver's logic-level power rail (Vcc on the schematic). This allows people to use the Easy Driver with microcontroller that output either 3.3V or 5V control signals. The 3/5V jumper (SJ2 on the schematic) comes 'open' from the factory (no connection between the pads) and thus is supplying 5V to the driver chip, and thus by default the Easy Driver works with 5V control input levels. To use the EasyDriver with 3.3V logic levels, simply solder a blob of solder on the 3/5V jumper pads. This will set the Vcc on the Easy Driver to 3.3V. The other jumper is labeled APWR on the board and is called SJ1 on the schematic. If you look very carefully on your Easy Driver, you will see a thin copper trace between the two jumper pads. From the factory, this jumper is 'closed' (i.e. shorted) by that little piece of copper on the board. So even though there is no solder blob there, it is in fact shorted. 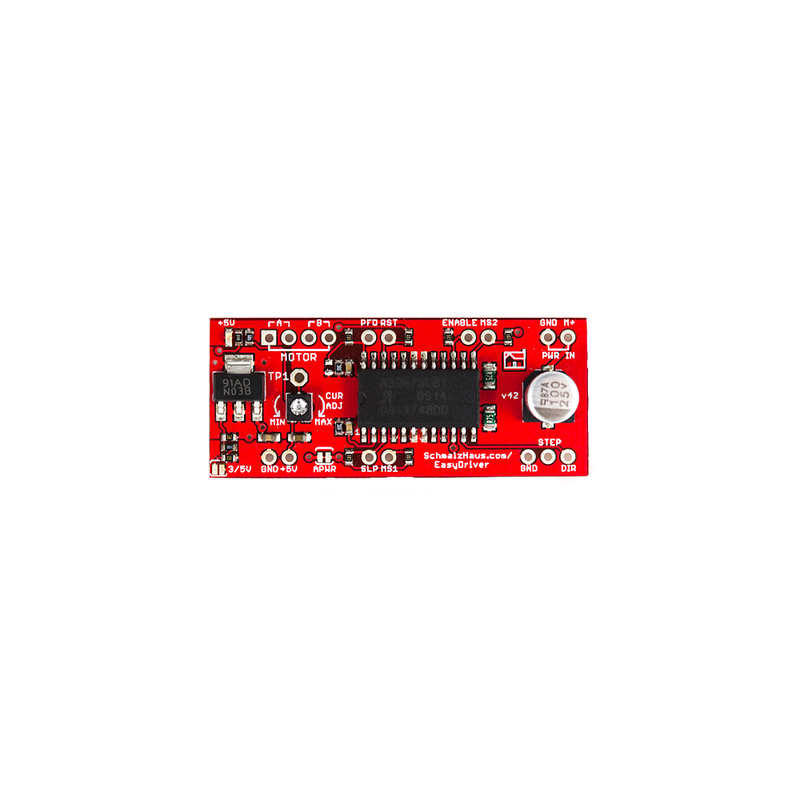 The purpose of APWR is to allow users to disconnect the built-in logic power supply of the EasyDriver and power it using their own 5V or 3.3V logic level power supply. You might want to do this for power savings reasons. For example, if you're using a 24V M+ motor power supply for the EasyDriver, the built-in voltage regulator (IC2 on the schematic) will get very hot because it's dropping that 24V down to 5V and giving up all of that extra voltage as heat. This is very inefficient and will raise the temperature of the board. Instead, if you already have a 5V power supply in your project (say a switching power supply that's powering your microcontroller), you can use that 5V power supply to power the Easy Driver as well as your other components. The way you do that is to cut that little trace in the APWR jumper, thus 'opening' the jumper. This will prevent any power from flowing through the built-in voltage regulator, thus preventing it from ever heating up. You then supply 5V (or 3.3V) power to the Easy Driver through the +5V pin from your external power supply. If you ever want to back to using the built-in power supply of the EasyDriver, you can then solder a blob of solder over the APWR jumper, thus 'closing' it again. It is very, very rare for people to use the APWR jumper. So unless you would like to power the logic side of the Easy Driver from your own power supply, you can leave it as it is from the factory. Q17) Does it matter which order I power things on? Can the Easy Driver be damaged by the order that things power up? A17) As far as I know, no. If you have a microcontroller board (like a chipKIT or Arduino) connected to your Easy Driver, and the microcontroller is powered from a different power supply than the BED is (say over USB from a PC), it might seem to make sense that powering up the microcontroller first would apply voltages to the Easy Driver pins before the ED is ready for them (since it isn't powered up yet) and cause damage. Based on my understanding of the input protection circuitry on the ED, and my extensive testing, there should be no damage caused in this situation. This answer only applies to the order in which power is applied to the boards - you still must not disconnect a motor from a ED that has power. EasyDriver by Brian Schmalz is licensed under a Creative Commons Attribution 3.0 United States License. Based on a work at www.schmalzhaus.com/EasyDriver. Permissions beyond the scope of this license may be available at www.schmalzhaus.com/EasyDriver.